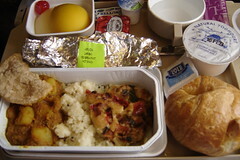 Here's a good example of the airline meals served between JFK and Mumbai. The round things in the corner were a peeled mango and pear -- not sorbet as I first thought. Everything was decent, and definitely a lot less boring that most in-flight meals. I wasn't sure what to do with the yogurt (mix it in with the main meal? ), so I opted to just eat it. Perhaps because this was breakfast, there was none of that milky pudding-like stuff that passes for dessert. FYI: review of the book Curry in today's NYTimes.